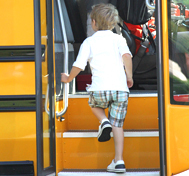 Why do we believe seat belts are needed on school buses? Watch these crash tests and see for yourself. The following videos are just a few of the crash tests and crash demonstrations SafeGuard has conducted at CAPE, the Center for Advanced Product Evaluation. This report, featured on ABC’s Good Morning America, shows what happens to belted and unbelted students during a side impact crash. This crash demonstration was conducted for ABC News and shows what can happen to belted and un-belted students in a crash. Some of the “children” are intentionally shown out of position to demonstrate why it’s so important for them to be seat properly. This sled test shows you what compartmentalization can look like for a child experiencing it first hand. The effect wearing a backpack can have on a student in a school bus crash. What can happen to belted versus un-belted students in a rollover. Another demonstration that shows what can happen to out of position students in a crash. When Nightline wanted to investigate why there are no seat belts on school buses, they turned to SafeGuard and CAPE for help. If you’d like to see more SafeGuard videos such as case studies and product videos you can watch those HERE.